"I make this as yearly tradition at holiday time in my home. I also make a batch of this to send to my brother for his care package that I send him when he is deployed. I will warn you, it is very spicy and addictive. There should be a 12 step recovery program for this stuff." Gently mix corn, rice, and wheat squares, oat rings, mixed nuts, mini pretzels, goldfish crackers, and sesame snacks in two 13x24-inch aluminum roasting pans, taking care not to break cereal. Stir bacon drippings, unsalted butter, Worcestershire sauce, MSG, liquid smoke, cayenne pepper, seasoned salt, chili powder, garlic powder, and hot pepper sauce together in a microwave-safe bowl. Cook on high in microwave for 3 or 4 30-second intervals, stirring each time, until mixture is warm, liquid, and fully combined. Stir seasoning sauce continuously as you pour half over the cereal mixture in each pan. Gently stir the snack mix and seasonings with a slotted spoon until thoroughly coated; do not crush cereal. Bake in the preheated oven until sauce is completely absorbed and the snack mix is crisp, about 2 hours; stir gently every 15 minutes. Cool completely and store in airtight containers. 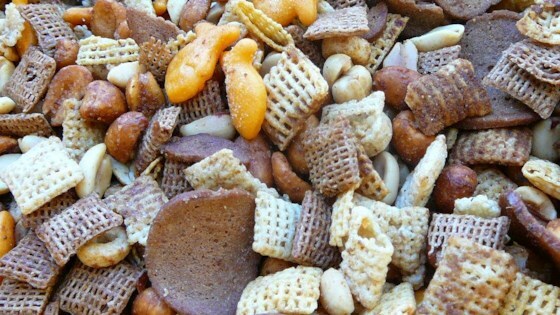 The snack mix stores well in freezer in airtight freezer bags, if it makes it that long. See how to make tender pulled pork with flavor as big as Texas.